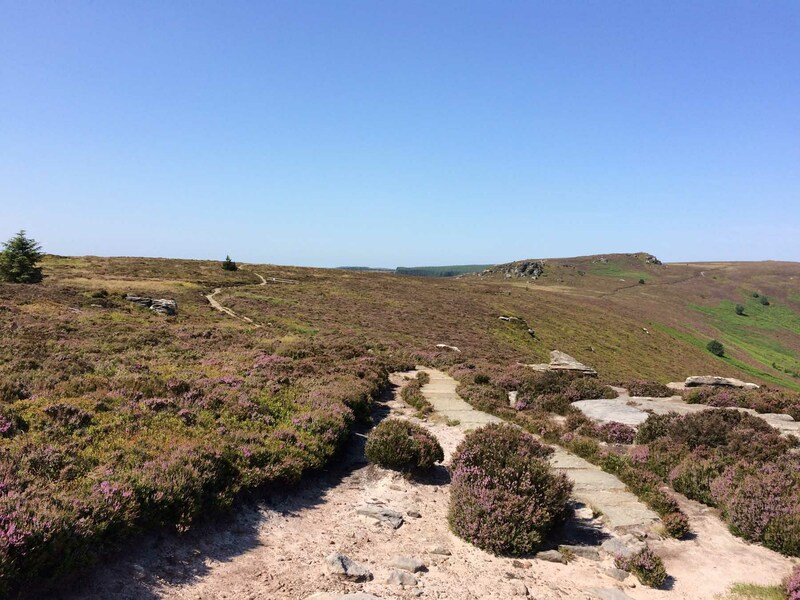 It’s a very damp overcast day as I write this, so it’s hard to remember what glorious weather it was when we were out on the Simonside Hills last week. It brings most sharply to mind how lucky we are to have photographs to preserve our memories. 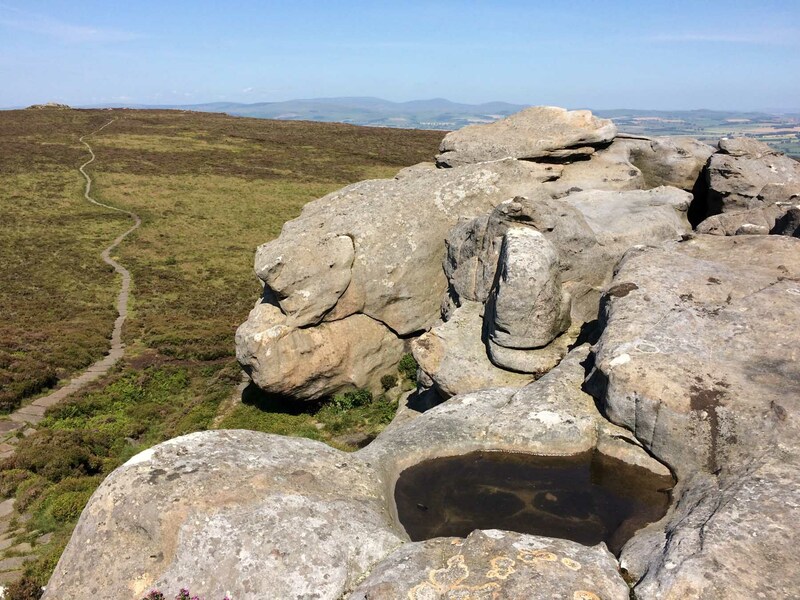 It’s a particular pleasure for me to do these walks (which I think is well-conveyed by our Simonside photos) because as a child I was never encouraged to embark on “proper” walks. These were seen as my father’s preserve. 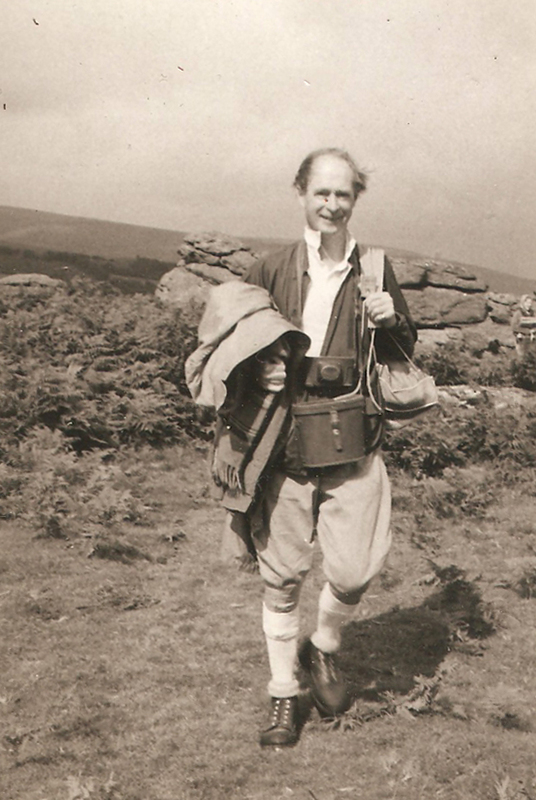 Here he is on Dartmoor in the early 1970s, and, my goodness, did he equip himself thoroughly for his walk!! I now have the binoculars which he was wearing round his neck in their fine leather case, and even without the leather case they are very heavy to walk with indeed. 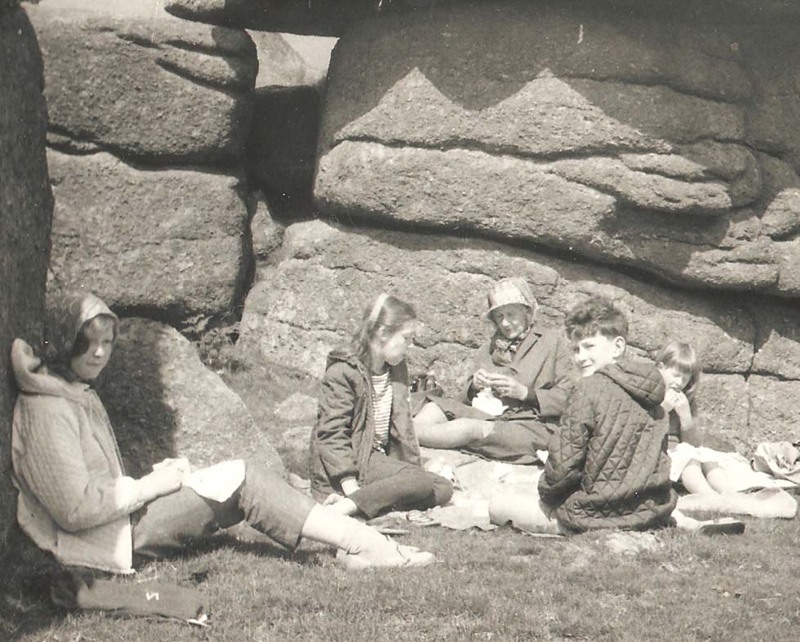 While my father marched over the moors, we children were left with my mother and grandmother for (usually) damp picnics under the rocks of Hound Tor. So I grew up believing I could never be a hill walker. What a joy it has been to discover in Northumberland that this is not the case! 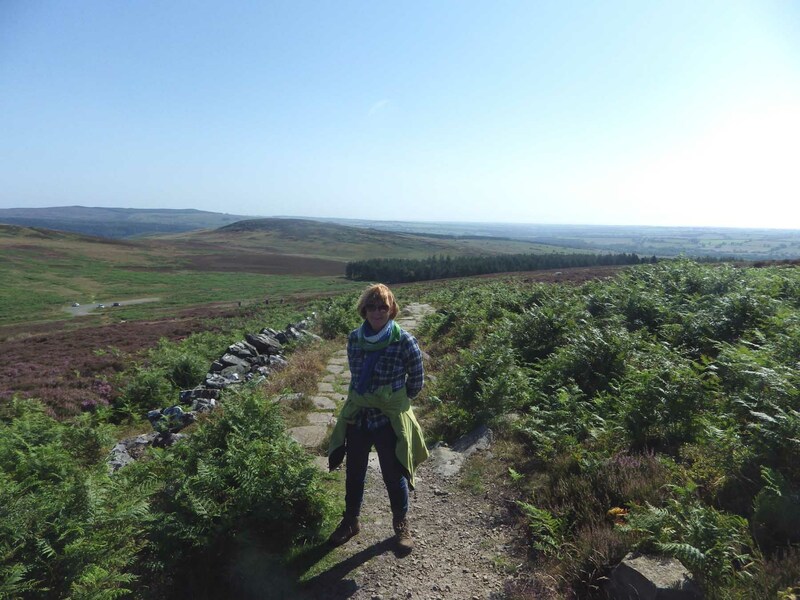 Our walk last Tuesday took us up the Simonside Hills. 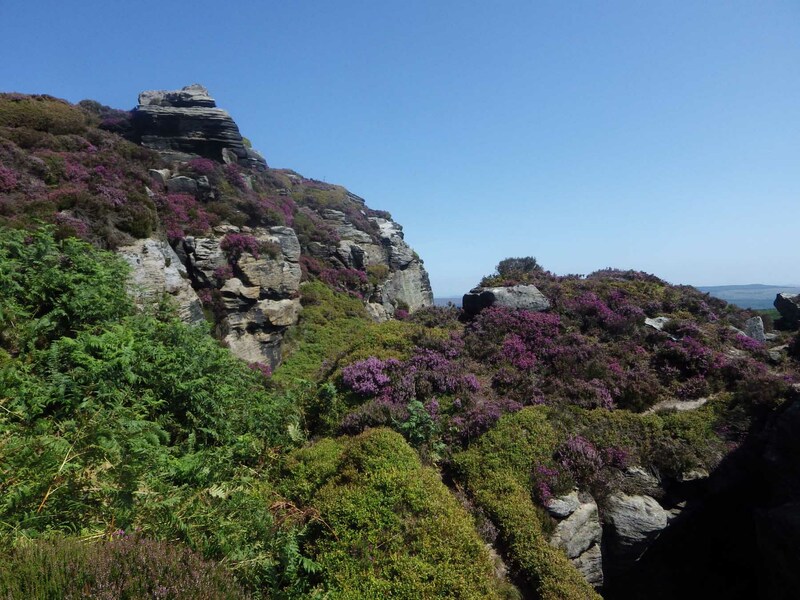 They are near Rothbury, about an hour’s drive away from where we live. 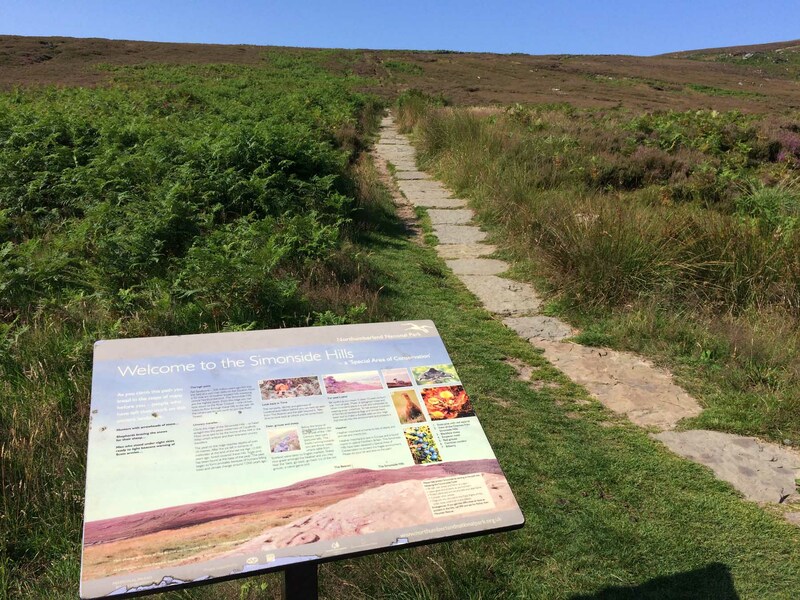 We started our walk at the Lordenshaws carpark, with a helpful noticeboard and the path stretching on and up into the hills. 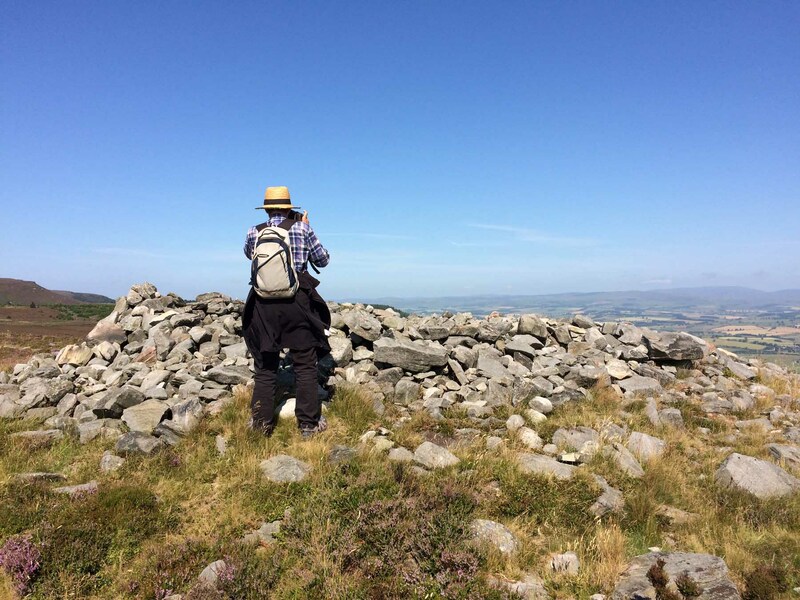 It was a day of brilliant sun, barely any breeze at the start – and hardly any other walkers either. The flora was abundant and beautiful. 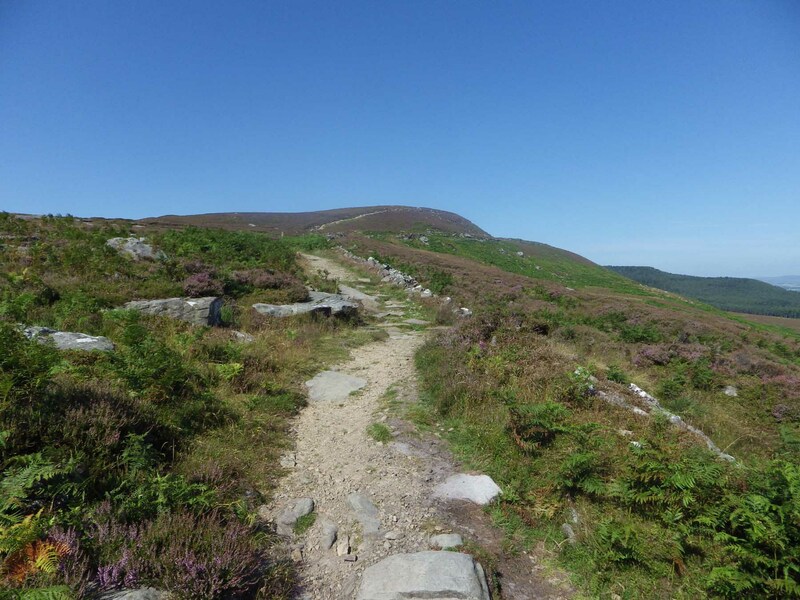 But what struck me most forcefully right at the beginning of the walk and further as we walked along the summit of the Simonside ridge was how managed the path was. Just look at these carefully constructed stepping stones! 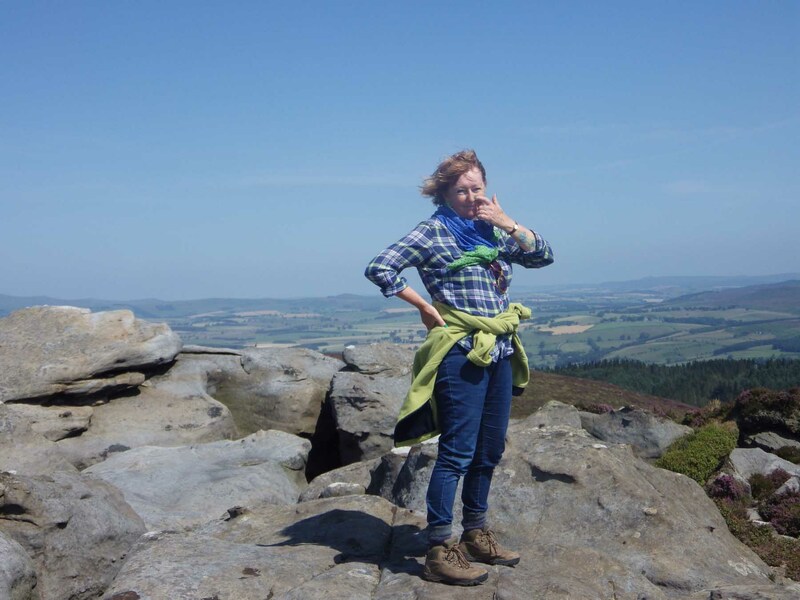 I guess this shows how inexperienced I am with hill walking. 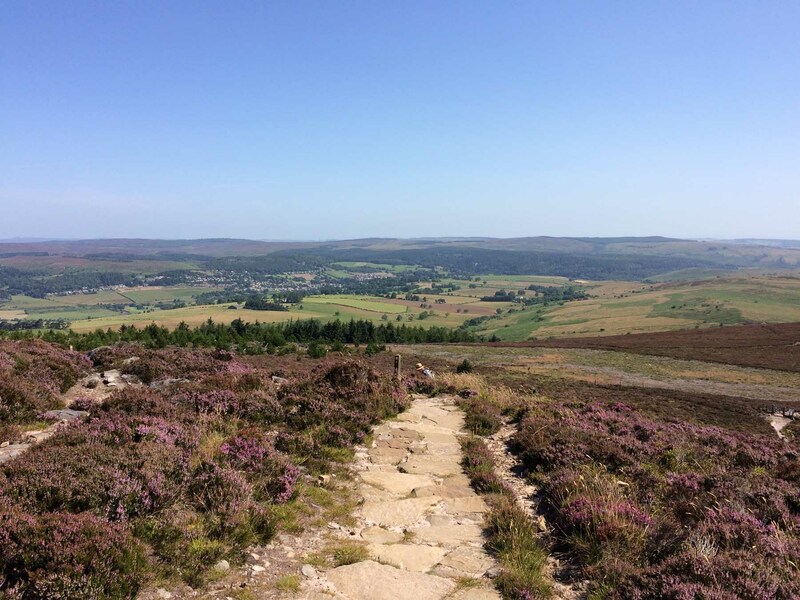 The Simonside Hills, not far from Rothbury and the more populated south of Northumberland, are heavily walked – and quite rightly so, because they are a magnificent walk. 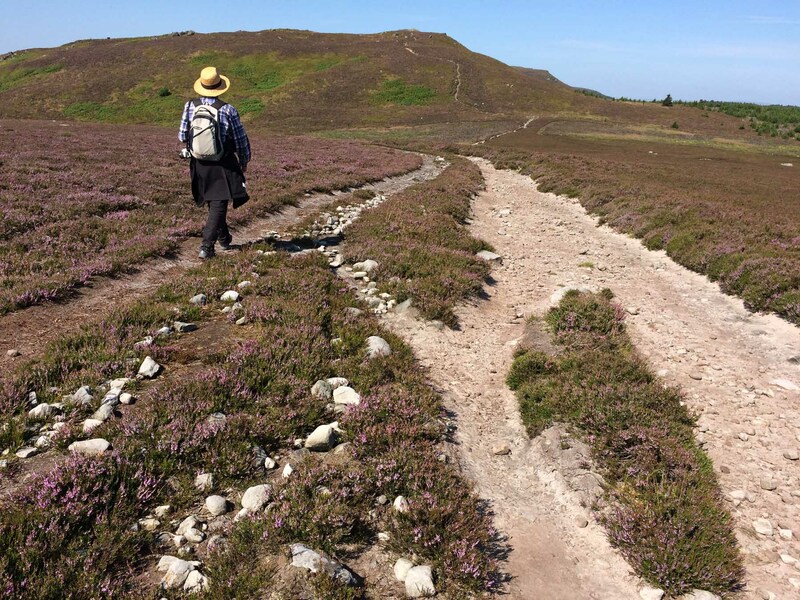 But walkers (and this, of course, included us) wear away the paths they love to walk. 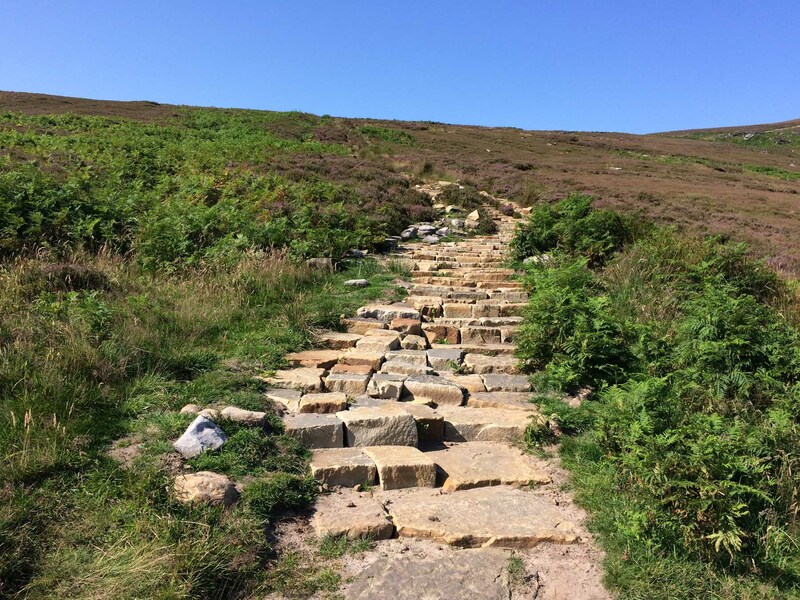 Where the path hasn’t been laid with slabs and steps, it was heavily eroded and very uncomfortable walking – the elements must bear some responsibility here! 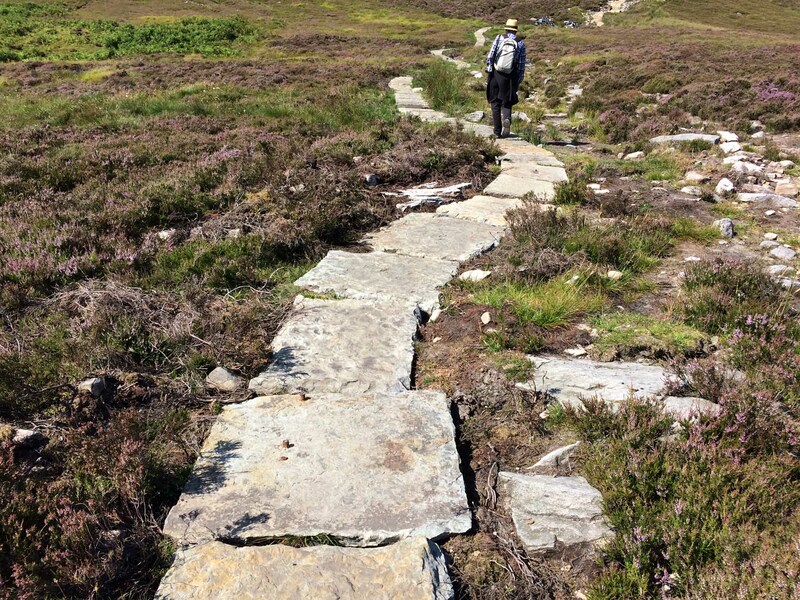 Further on the path was slabbed – much more comfortable walking. 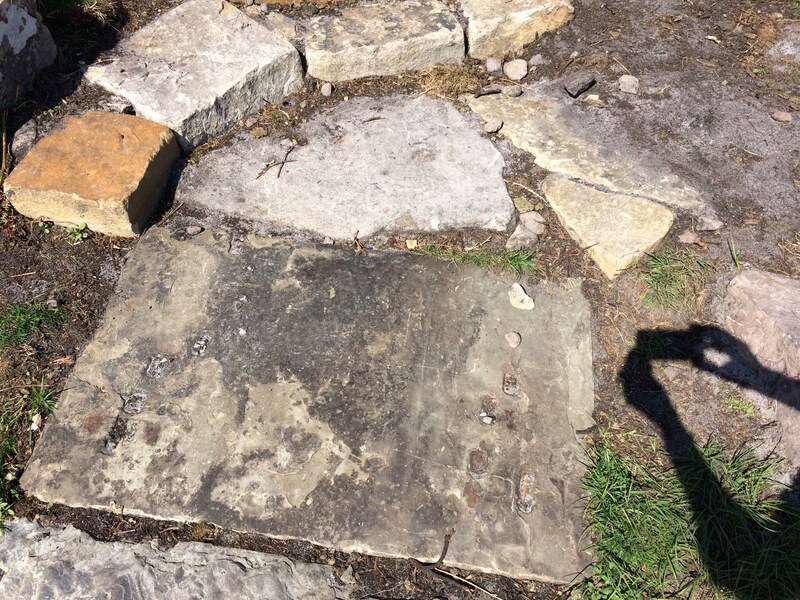 We laughed to see that some of these flagstones bore evidence of a former life – can you see the metal marks on this flagstone? In some places there were metal protuberances still well-proud of the stone …. hmm, what happened to Health & Safety we wondered … ? They did look a bit like re-used gravestones, and I half-expected that if you turned one over you would find names and dates. 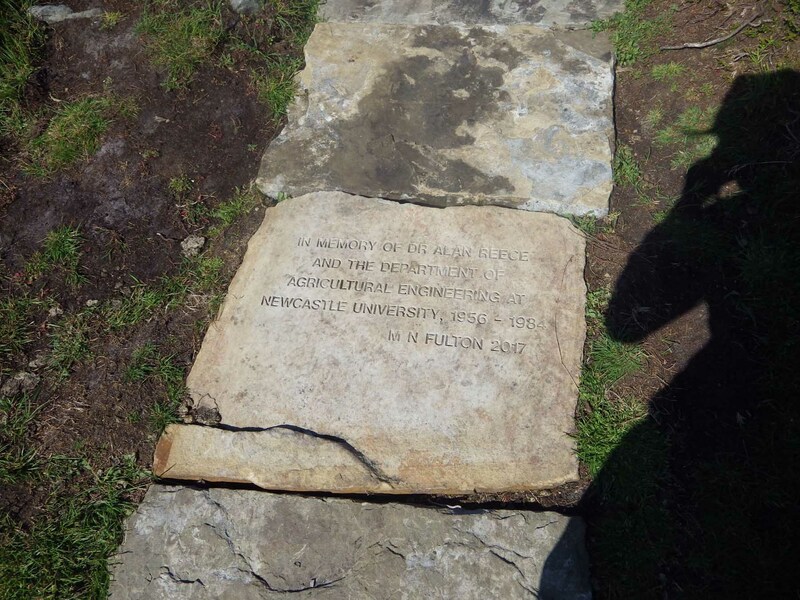 Touchingly, a flag stone remembers Dr Alan Reece. So many greats to attach to his name. A fine place to be remembered. On the path went … With fine views already back to the carpark and our little white car … Past the empty bags that must have delivered the stone for the recent path repairs … (Later on we met this helpful sign explaining all.) 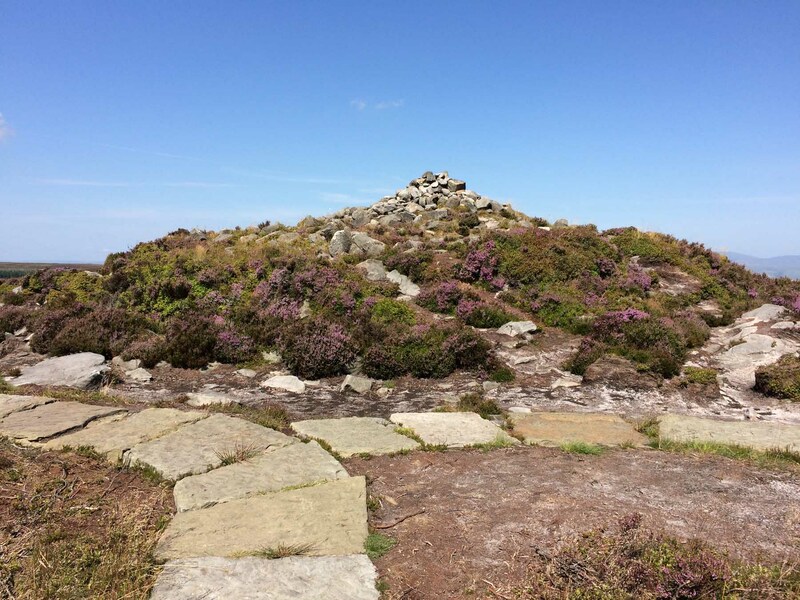 Before long we’d reached the first marker, the Beacon Cairn. 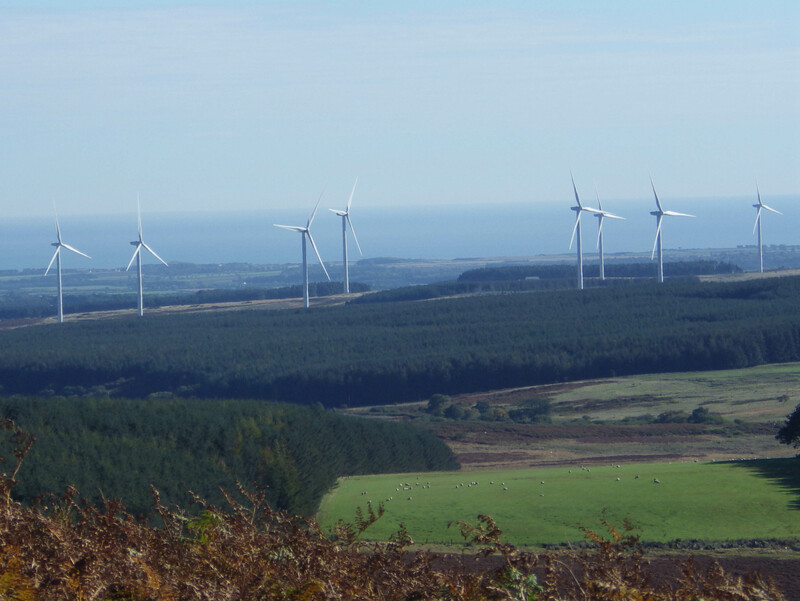 With magnificent views stretching down and around to the wind farms of the south … And back to Rothbury. 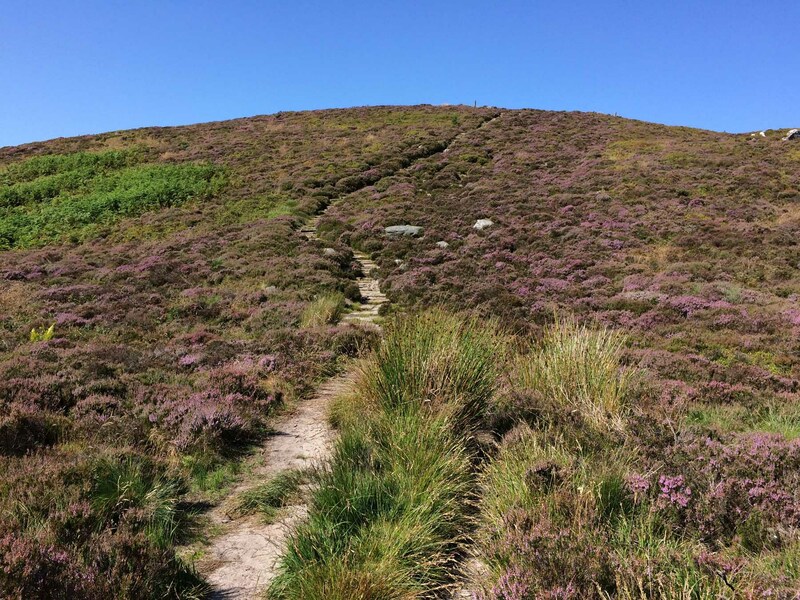 The route stretched out from here pleasingly along the ridge … (you can see here most clearly how people have made new paths in the heathery peat to avoid walking on the uncomfortable old pebbly path) … And the start of the climb to Dove Crag … Glorious walking through the heather – not quite at its best yet but heavy with bees …. And whortleberry sustenance! 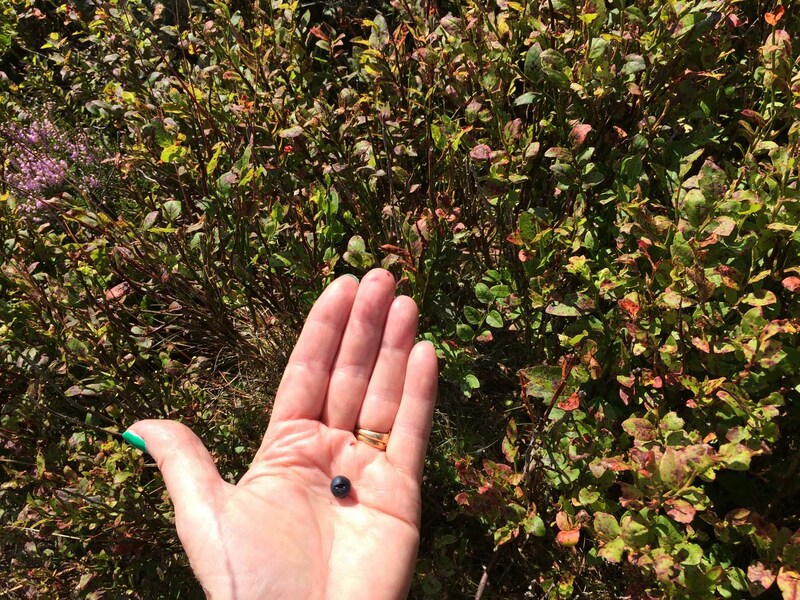 (actually known as bilberries in this part of the world. Whortleberry is its Devonian name). Stephen following me (quite a way behind!) 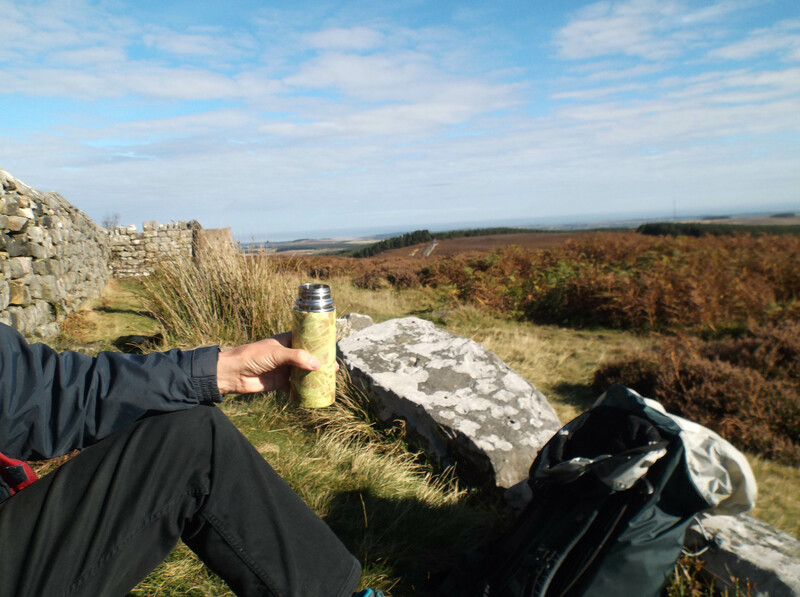 at this point, so I’m feeling a bit smug … Bit off a show-off really … To Dove Crag and more sustenance …. And, oh the views! Accompanied by a glorious sense of well-being! Further on and further up (as the children exclaimed at the end of C.S.Lewis’s Last Battle) … At one point you are redirected onto a completely different path – you can see the old path veering away to the right behind the fencing, and the blue notice explaining that this is because of erosion control. A colour change as we passed through red grasses … With the odd curious conifer standing in striking contrast. 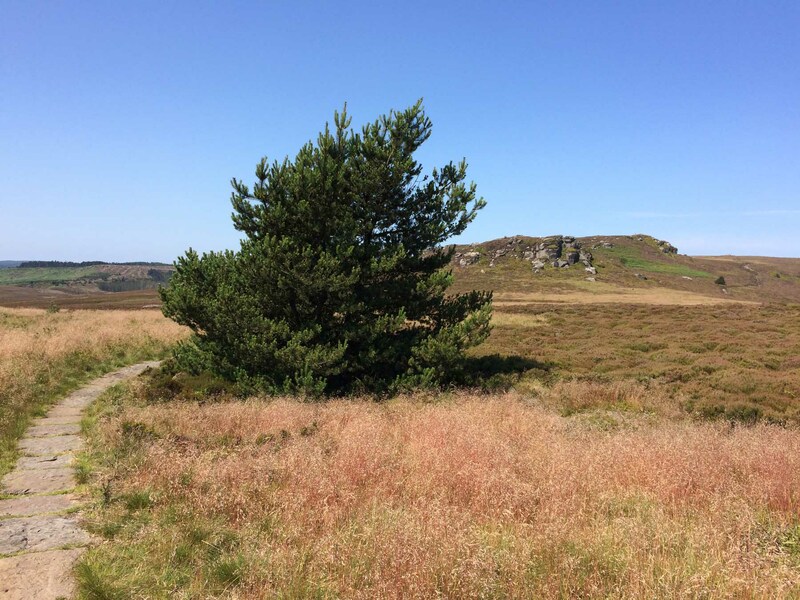 We met several of these conifers on our way – presumably seeded by the birds from the large conifer plantations at the foot of the Simonside ridge. On and up again to the highest point … The colours are amazing! 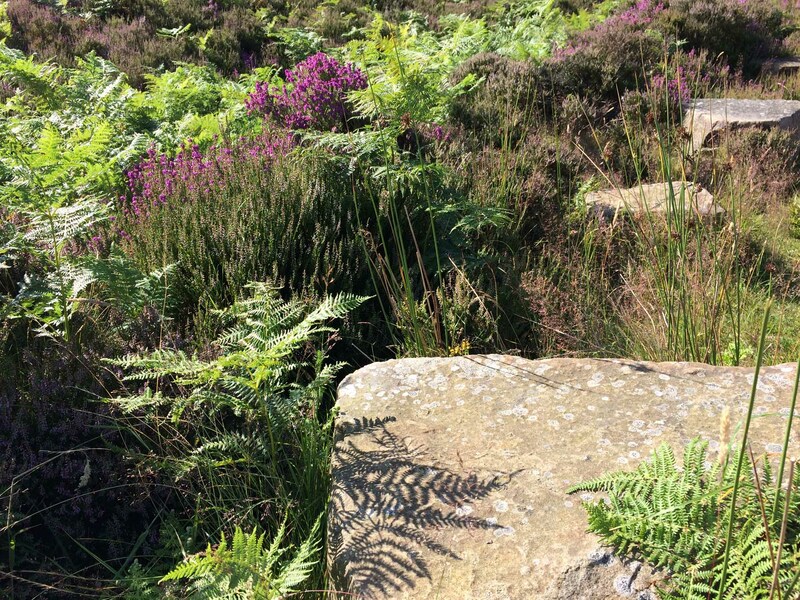 #nofilter Then just a little way ahead to the final cairn – which seems curiously suburban garden to me … Isn’t this the effect rock-gardeners strive to create? 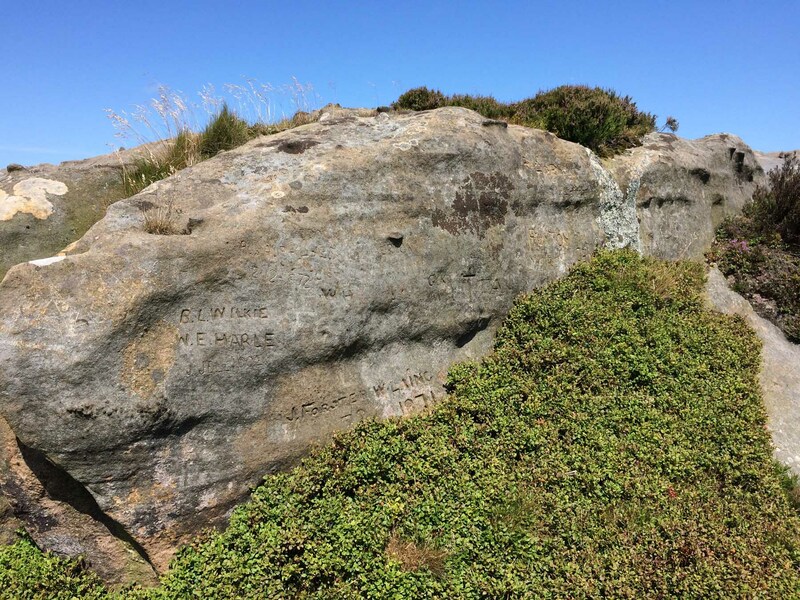 And the path curves round to the final crag … Where people cannot resist leaving their marks … But we just climbed up to enjoy the view … What caught me unawares was this huge leonine stone monster of a crag – yes, that’s what I was standing on above! Seems almost an imposition for such a fine beast. Curiously nowhere have I read about this wonderful stone shape. 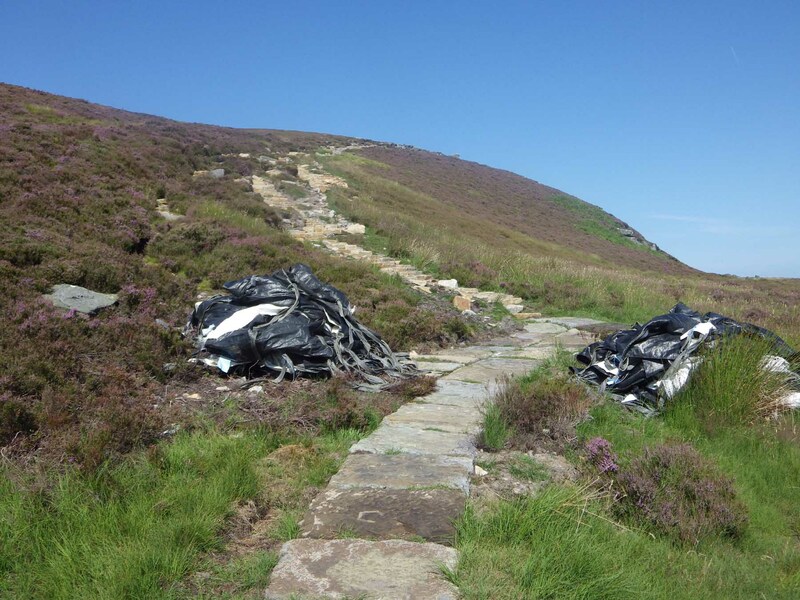 One can imagine the stories of the Simonside beast loose and roaming the hills …. 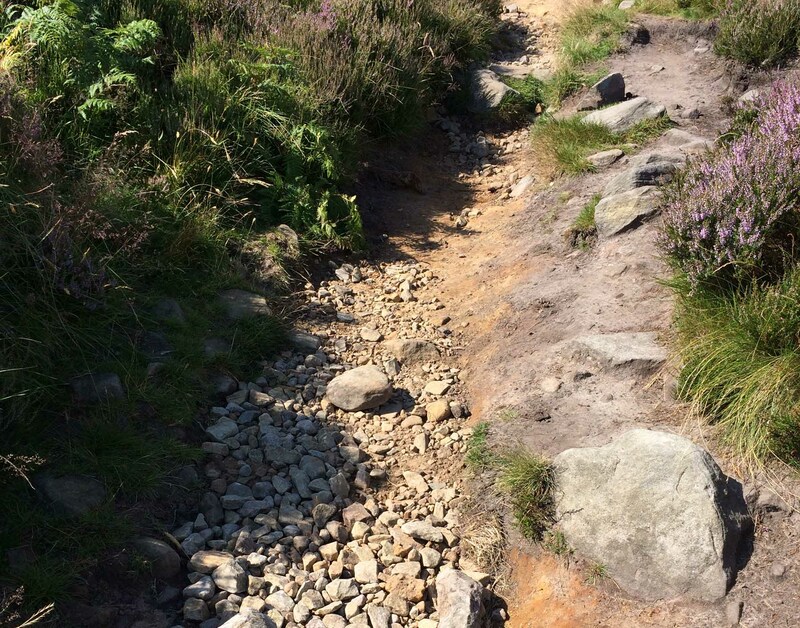 And with that our route took us back, retracing our steps … Well, not quite – there was a small diversion. 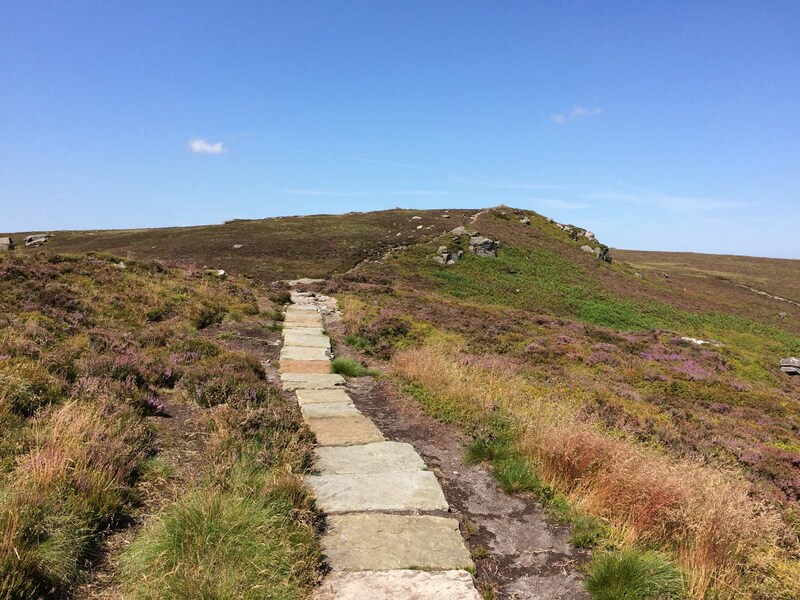 Stephen had found the proposal stone … To our surprise no path led the way to the Proposal Stone over the heather – do so few people visit it now? 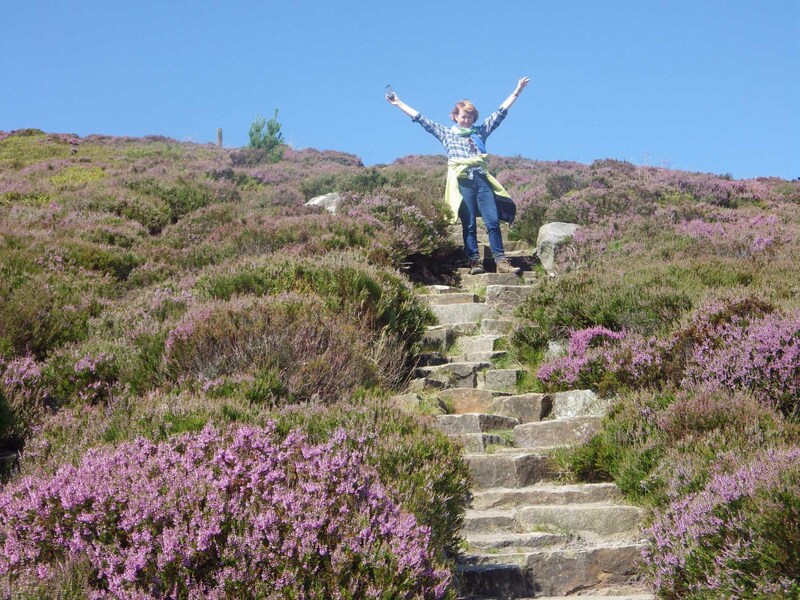 You have to break all the National Park rules and climb through the heather to get to it. We had a bit of banter because I too am a K …”So who was this J?” my Stephen demanded, and then …. 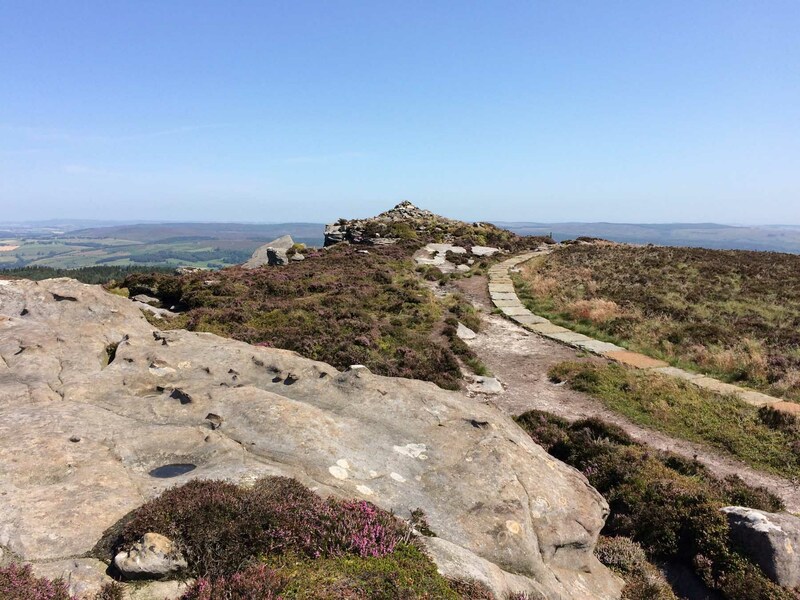 magically we connected to the app and Simon Armitage’s poem about this place. 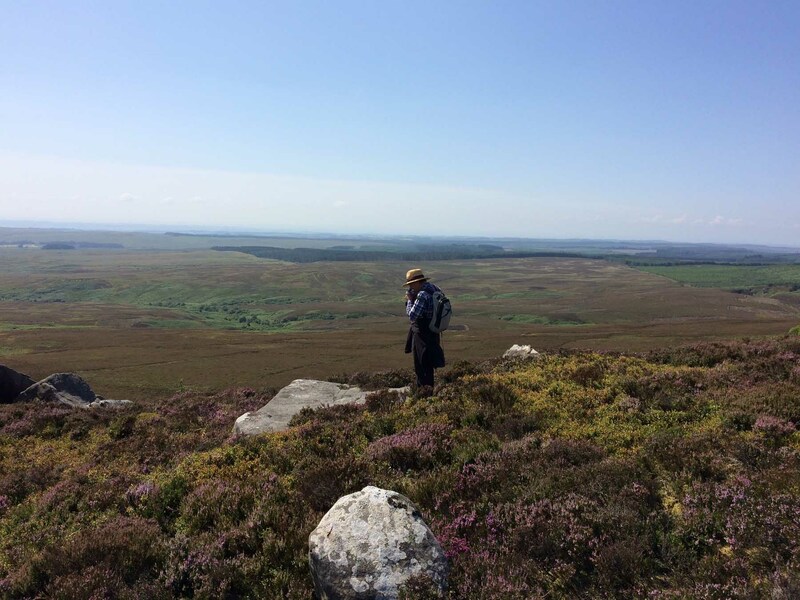 The poem isn’t written down, so the only way to hear it is to climb the Simonside hills with a smart phone. 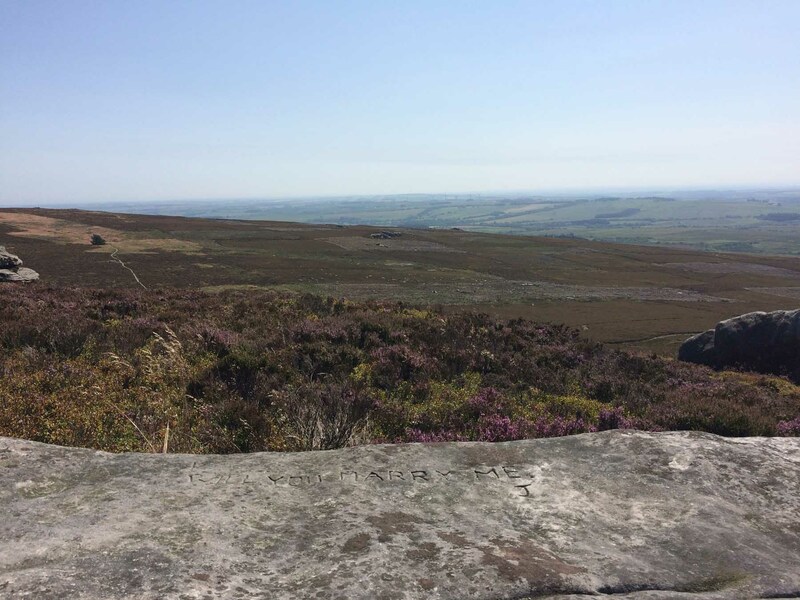 Disappointingly neither of us can remember much of the poem – just odd words and phrases stand out: the Taj Mahal of this empty space, the heather, the bilberries and the cotton grass – all as bridal accompaniments. Despite our failing memories, it was a rare and remarkable experience to hear the poem spoken in this place like that. 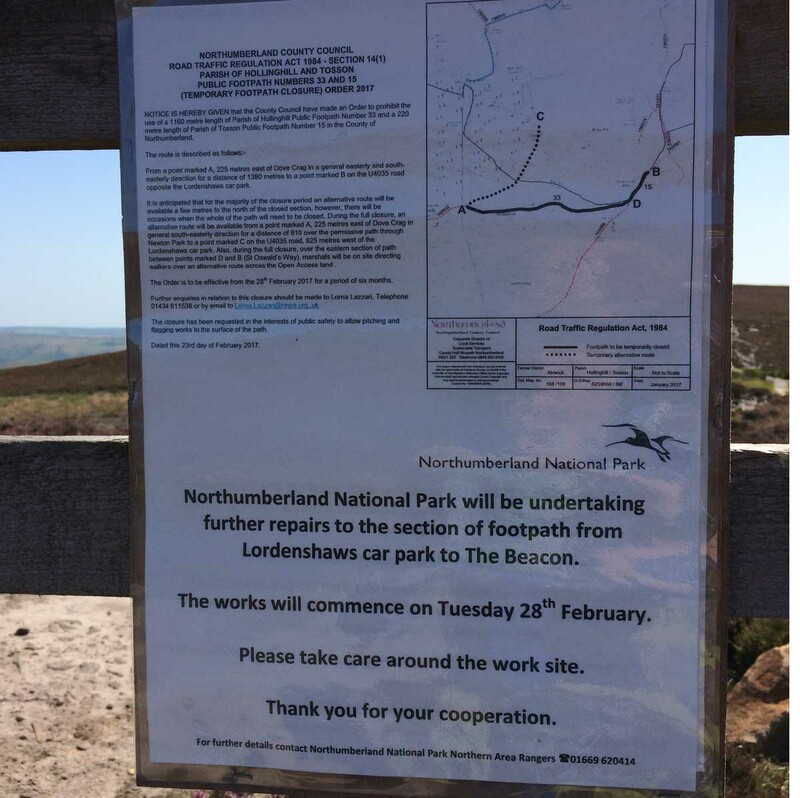 Thank you so very much Mr Armitage and technicians of the Northumbrian National Park. 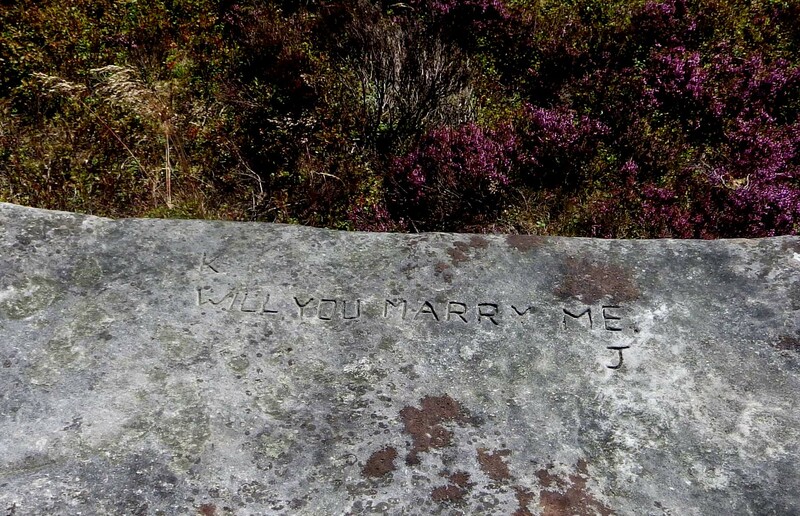 What a place for a proposal! Did she say yes? Nobody knows. In fact, nobody knows who put the proposal either – or when. (Although you can’t hear the poem, you can listen to Simon Armitage speak beautifully about this project here.) What a walk! 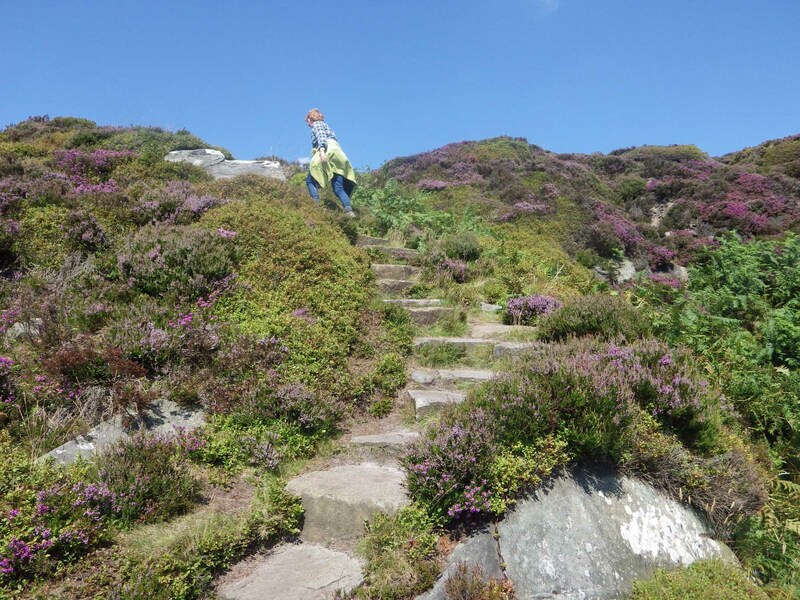 The walk up to Ros Castle Camp is a favourite one of ours. 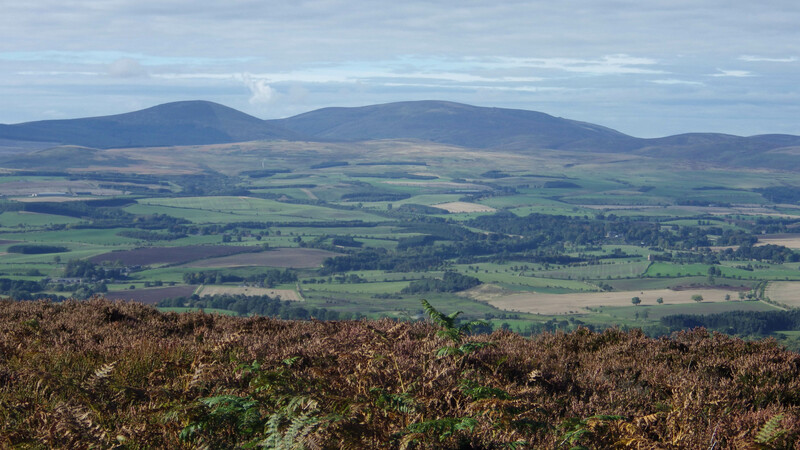 It’s not a long walk, and the reward of just fabulous views right across north Northumberland is well worth the steep climb. Looking up from where we parked the car, it doesn’t appear to be far to walk at all. 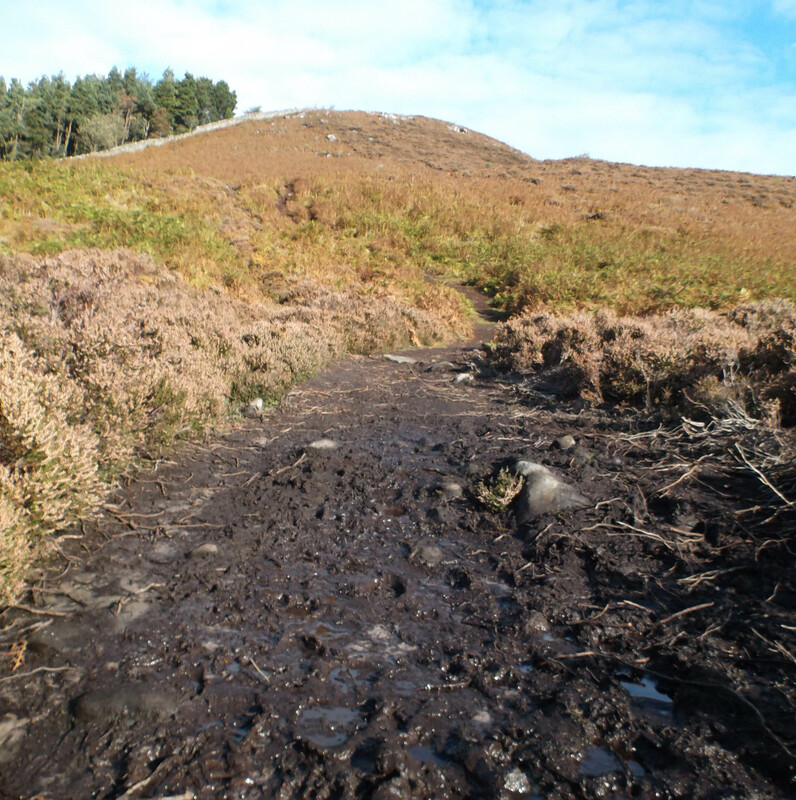 But the walk was surprisingly muddy. When you pause to look back, you realise just how far you have climbed. Our little white car is just a blip on the road. 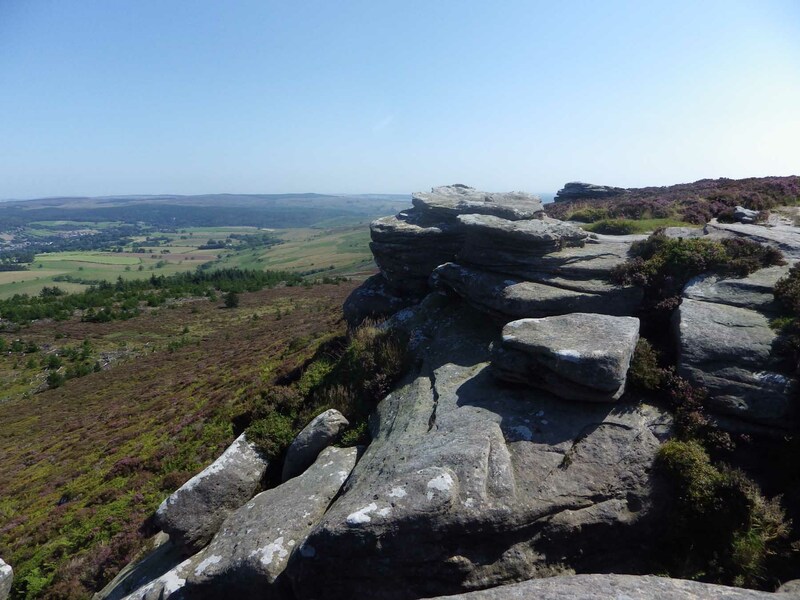 At the top, you are blown away by the views – and sometimes by wind! 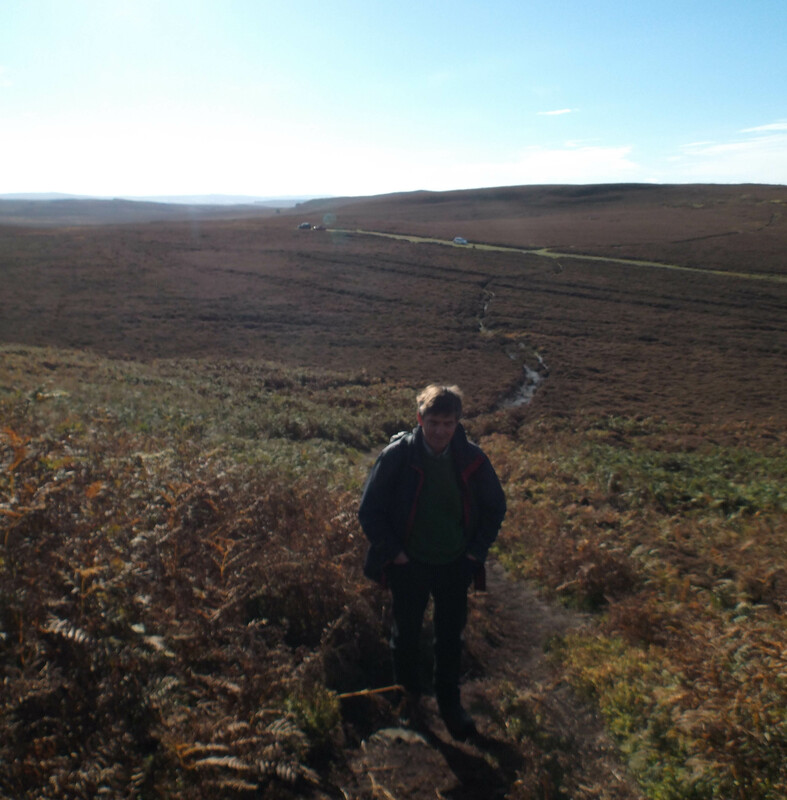 (not on this walk which was almost completely windless). 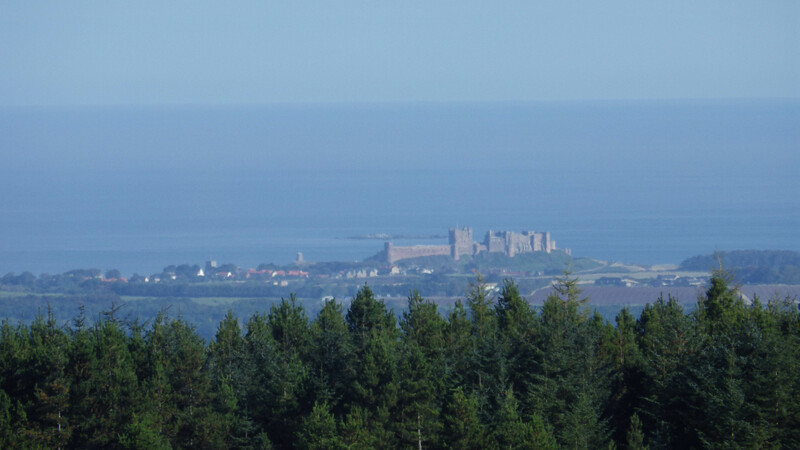 From here you can see for miles and miles and miles …..
There’s Bamburgh Castle on the coast …. 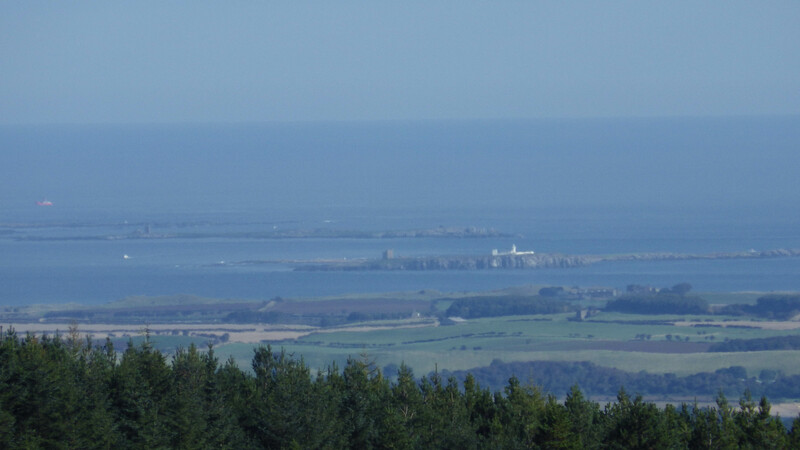 and the Farne Islands …. 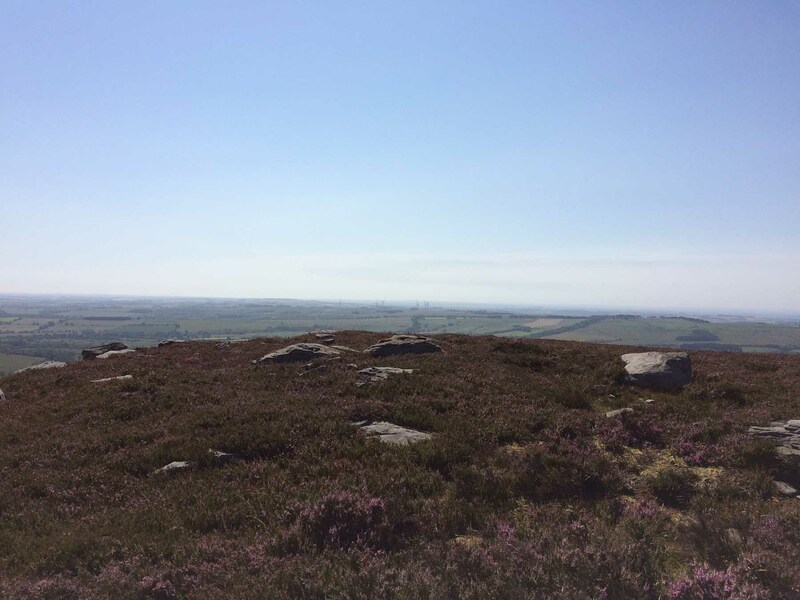 In the other direction, you can see the Cheviot range … You can also see all too clearly the much-lamented wind turbines obstructing the views of the coast. 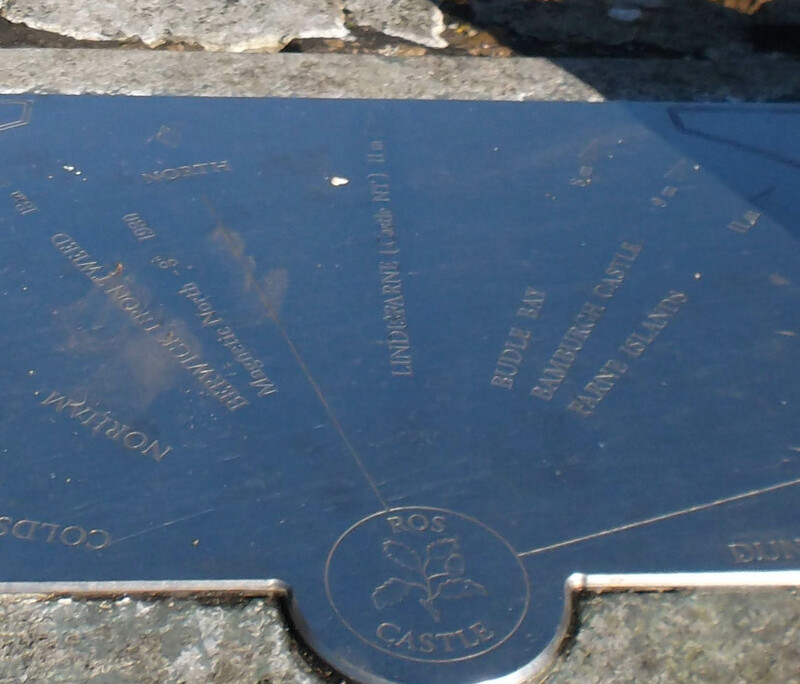 To help identify the places you can see from here, the National Trust has set up a topograph. It’s a nice little stone enclosure from which to take photographs. 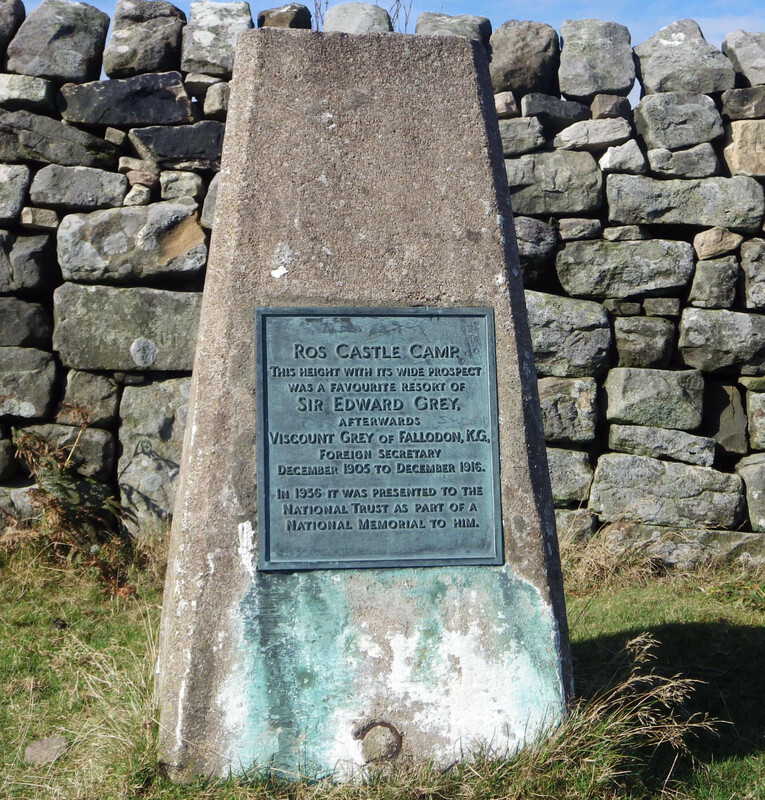 On each of the four stone walls lie metal plaques indicating with precision what you can expect to see on a good day. 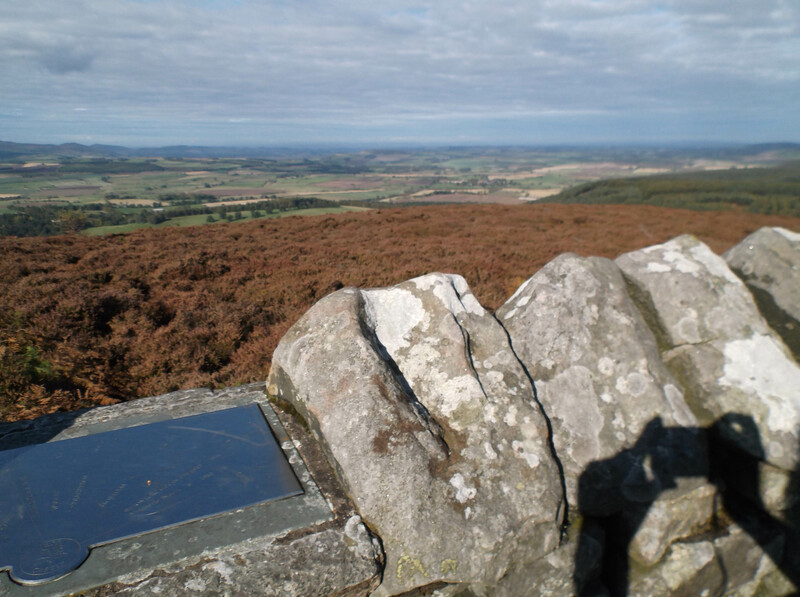 This plaque points from Coldingham (on the left) to Dunstanburgh castle (partially obscured, but on the right). In between, it points to Norham, Berwick-upon-Tweed, Magnetic North, North, Lindisfarne, Budle Bay, Bamburgh Castle and the Farne Islands. 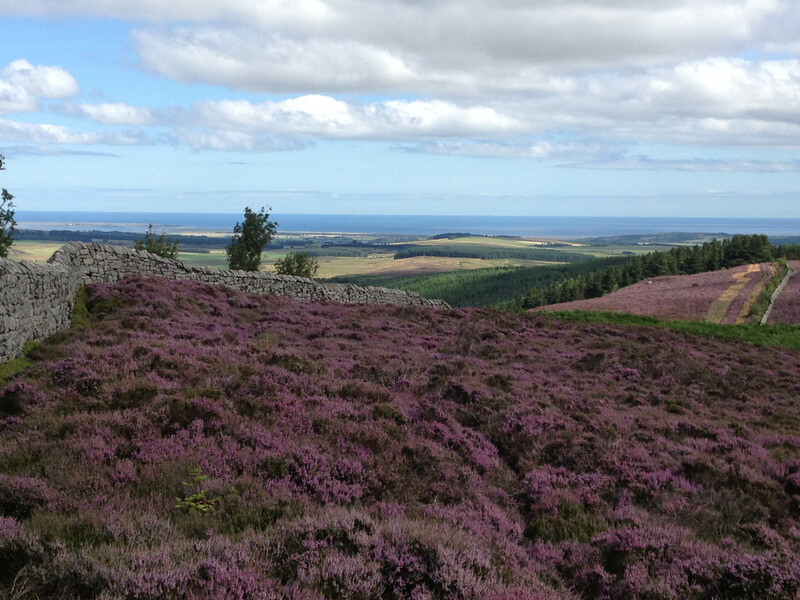 Here is the view to our home just south of Berwick-upon-Tweed. 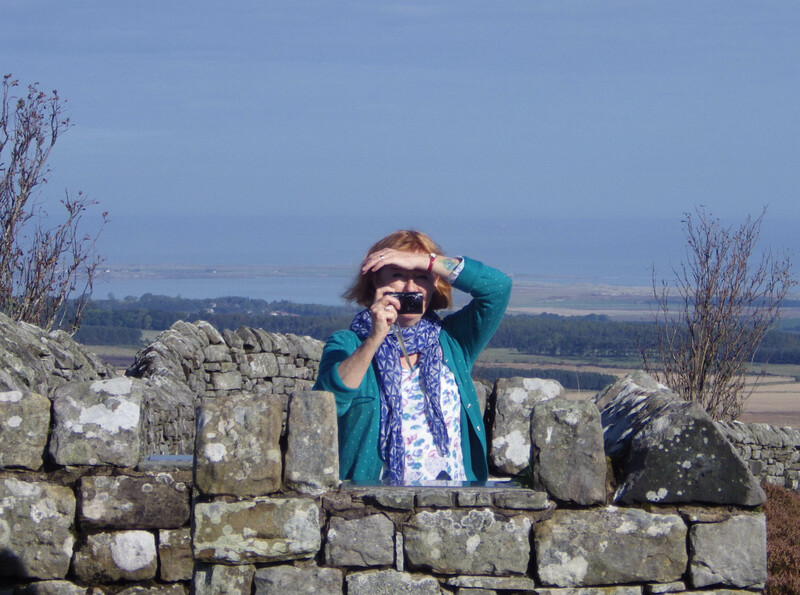 (Not that we could see Berwick from here – it was obscured by the hills.) 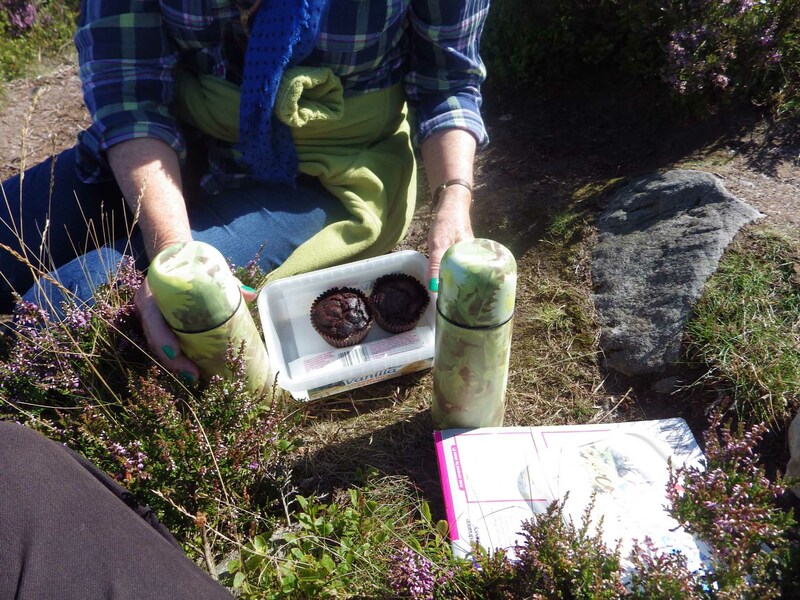 This is a great place to stop for a bun and a flask of coffee. King of all you survey. You may well ask where the castle and camp are. 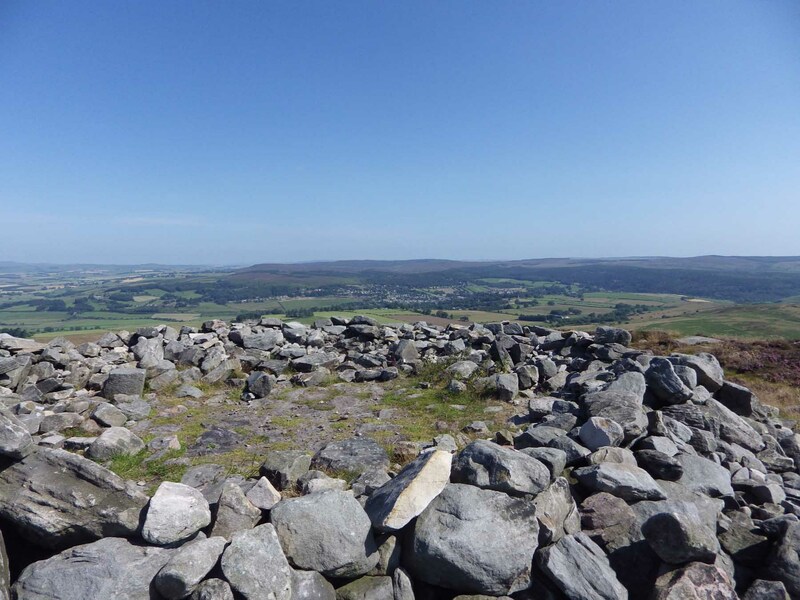 Apparently – according to Wikipedia – there was a 3,000 year old Iron Age hillfort here. 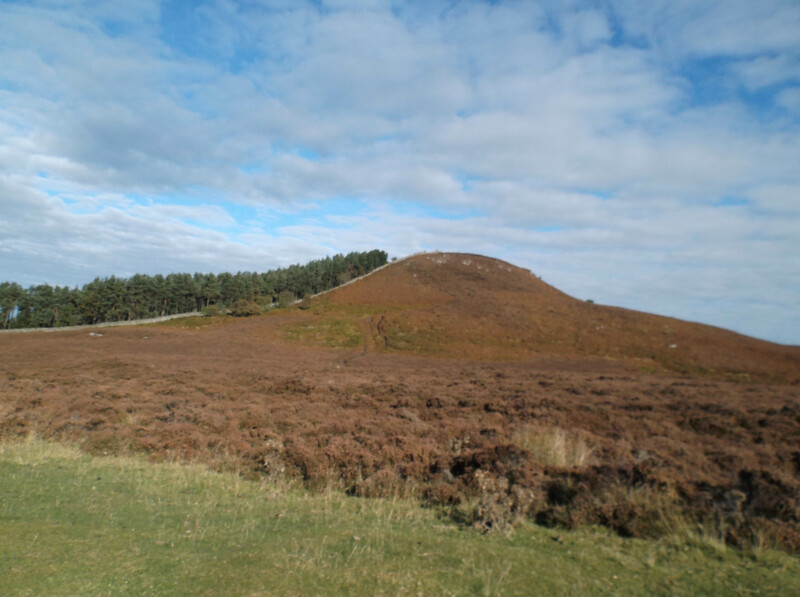 Unfortunately, the remaining defences – banks and quarry ditches – are concealed by the bracken, and the visitor really has no sense of it having ever been a hillfort. 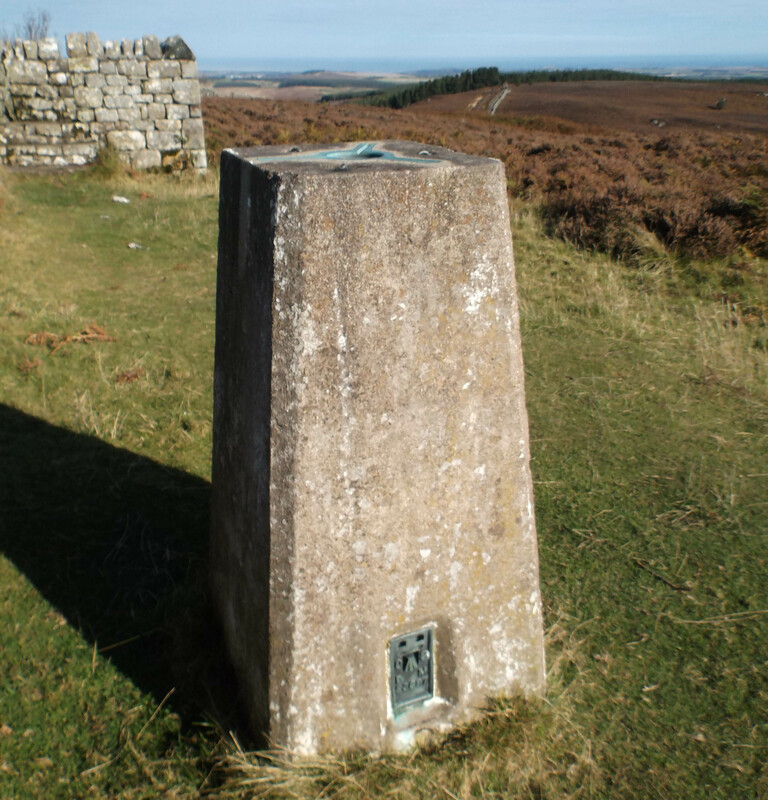 There is another modern construction here – a triangulation station (commonly known as a trig point). 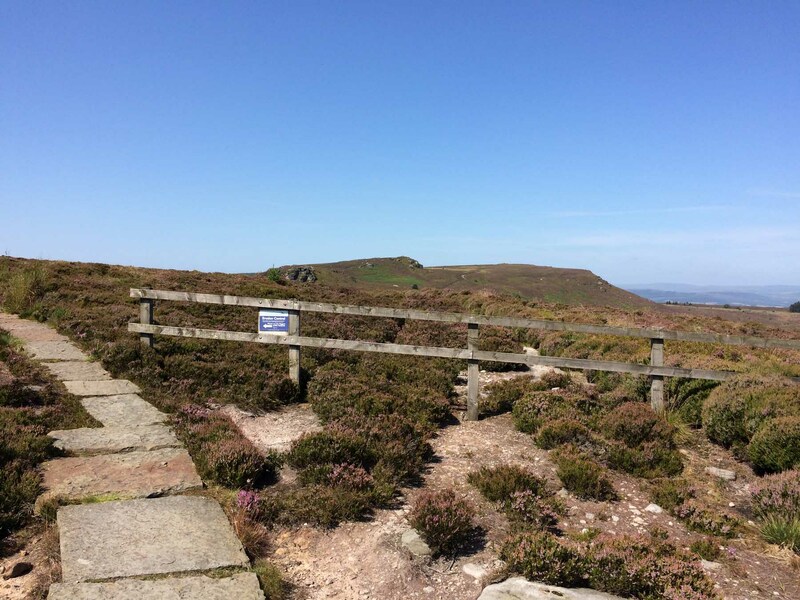 At the base, you will find the Ordnance Survey bench mark code: S3697 (useful if you’re into “bagging” trig points!) 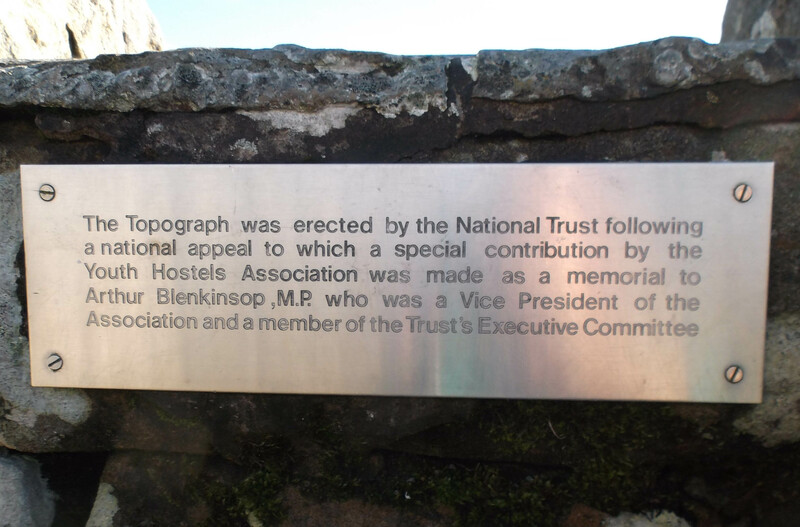 But on the other side, there’s another plaque that tells some more of this place’s history. The Greys were a Northumberland family of some distinction. Edward Grey’s great-great-uncle was the Earl Grey, famous for the Reform Bill he introduced, and probably even more famous for the tea named after him (apparently created to conceal the chalky taste of the local water). 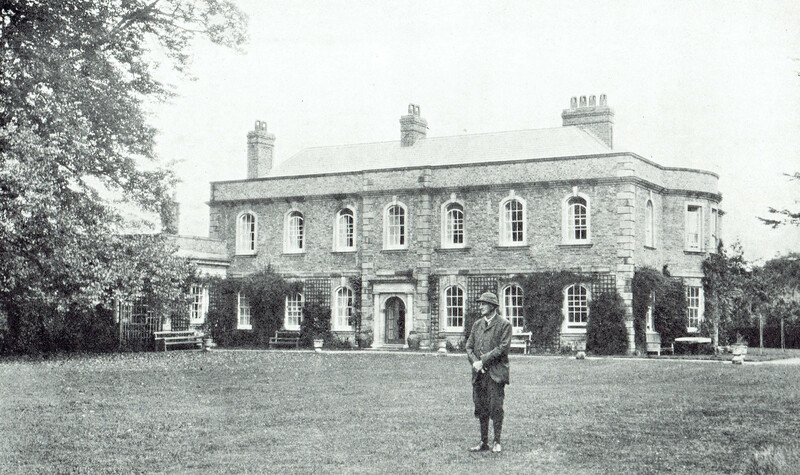 Earl Grey’s family home, Howick Hall, is nearby, as is Sir Edward Grey’s home, Fallodon (here photographed in 1932). Together with his first wife, Dorothy Widdrington of nearby Low Newton Hall, Edward Grey loved the Northumbrian countryside and way of life. (Rumour has it that theirs was a chaste marriage and he had affaires and illegitimate children in London). 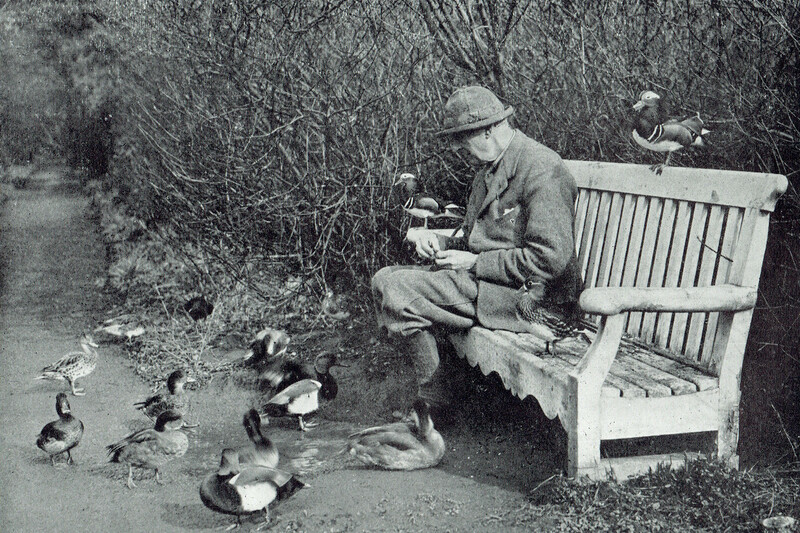 For many years he lived this strange dual existence with power and importance and sophistication in London alternating with frequent weekends at home in Northumberland and birds and walks and fishing there. Unlike modern travellers, Grey was able to avail himself of the family right to stop mainline trains at little Fallodon station, a few hundred yards from his door. (This ancient right came to the family as part of the deal when the railway was constructed through Grey land. It, of course, no longer exists – the station has gone, and I read somewhere that the railway authorities bought it off the family in exchange for free unlimited travel!). 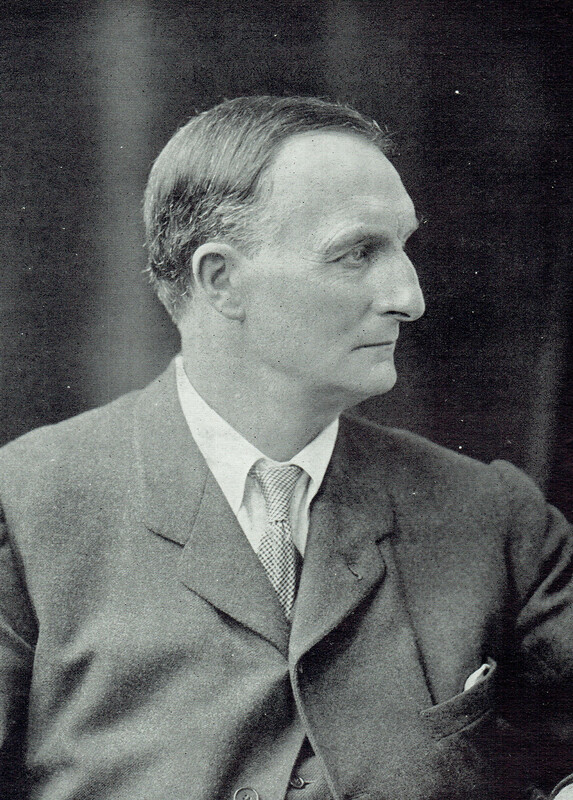 This picture is of Grey in 1918, a couple of years after he had ceased to be Foreign Secretary. By this time his sight was severely limited – he had struggled with deteriorating vision for quite a while as a result of severe degeneration of the retina and choroid in each eye. He had longed to retire from politics earlier (and that would undoubtedly have improved his health and consequently his eyesight) but was restrained by Prime Minister Asquith. 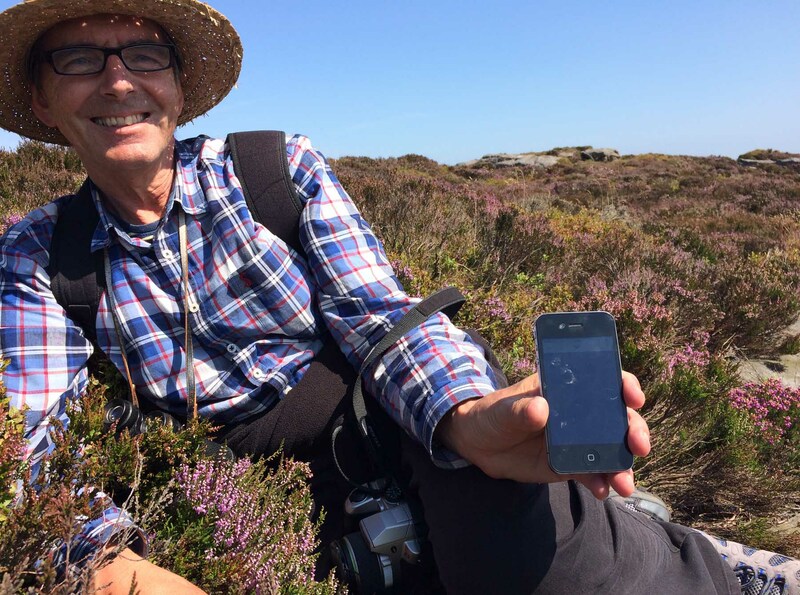 So ironically, Grey – an enthusiastic and knowledgeable birdwatcher and walker (he wrote a book called The Charm of Birds with his second wife), was only finally free to enjoy his beloved Northumberland when he was almost blind. 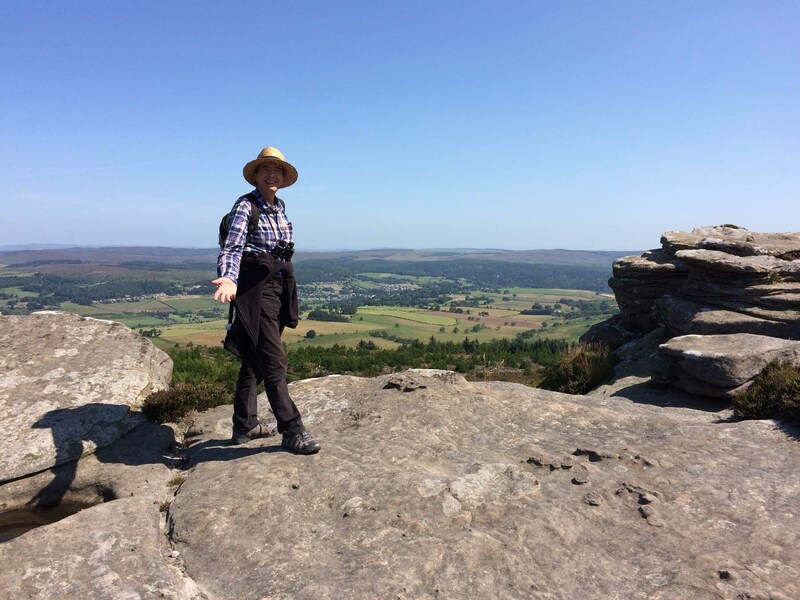 Here he is in 1931, a couple of years before he died, When I walk up to Ros Castle Camp, I think of Edward Grey taking the same path, weighed down with the cares of State. And as we watched kestrels and partridges, I thought of how little he could see. He would have been able to smell the place though – and wow, did it smell wonderful the day we visited! Fresh and clean and heathery. 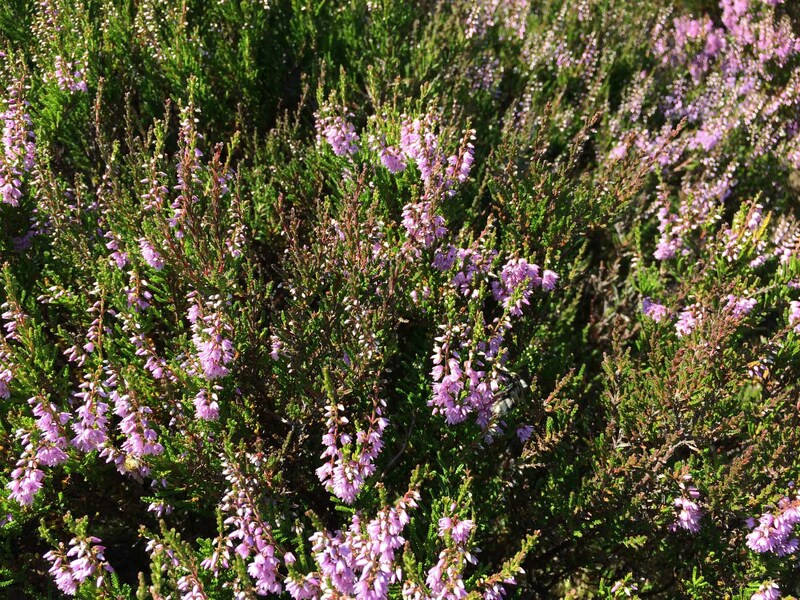 It is churlish to complain on a day with such gifts, but I do prefer it when the heather is flowering and purple as it was one August day last year. 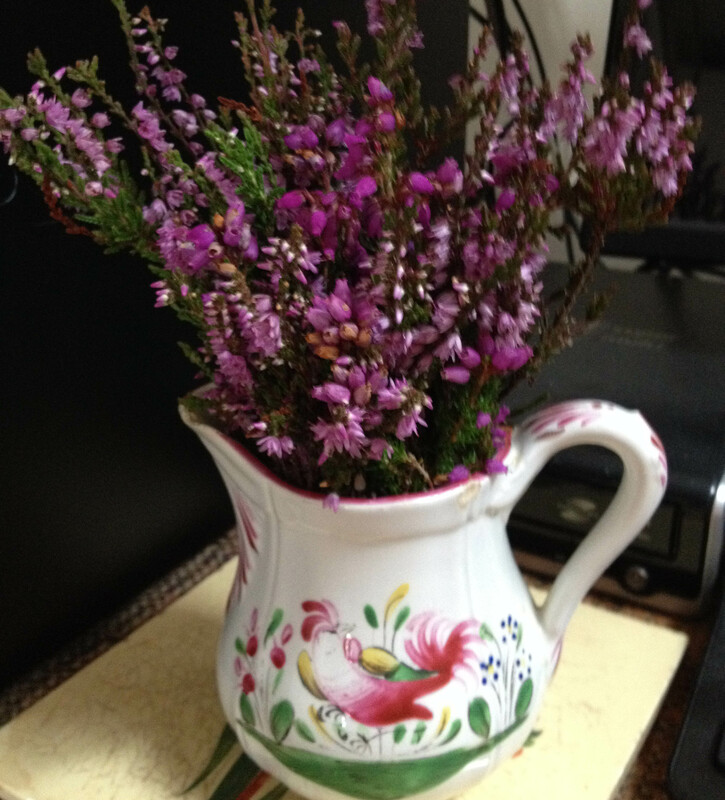 That day I brought home a small posy of heather to remind me of a glorious walk. This trip I’m having to resort to a virtual posy.